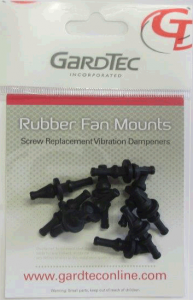 Anti-vibration rubber case fan mounts make cabinet cooling fan installation easy. Ultra soft rubber material is used to keep the mounts from being damaged during installation. The universal mount design fits most open case fans and PC cases. Its design reduces fan noise dramatically. Lightweight fan mounts at GardTec are easy to install. There are 10 mount components per pack. Purchase high quality rubber case fan mounts in bulk for discounted fan mount pricing. -High quality materials ensure long life even at high temperature. -Quick and Easy tool less installation.